This post contains Booking.com affiliate links. I may make a small commission on bookings completed through these links. Ah, the passing of time. The older we get, the faster it seems to go. Perhaps this is why it feels as though the entire summer season has slipped away—if not unnoticed then at least slightly under-appreciated. In an effort to squeeze a proper vacation out of the last dregs of summer, Johan and I took a mid-September week to go on a road trip. And no, traversing from city to city is not quite as relaxing as beaching oneself alongside a body of water with few worries beyond maintaining grasp of a cold beverage and occasionally reapplying sunscreen, but we took a 10-night drive through Italy for our belated honeymoon last November and it was nothing short of delightful. As tempting as it was to head south again (I see you, Lake Garda), we decided to mix things up a bit. We took to Google Maps to glean inspiration and ultimately determined that driving east would yield three interesting cities and two new countries for both of us, all within a very reasonable seven-hour drive home on the final day. I poked around for hotel options, secured accommodations in Vienna, Bratislava, and Budapest and the trip was officially A Thing That Is Happening. On the morning of 16 September, we loaded up the Passat and departed Nuremberg for the much-revered city of Vienna. After checking in at our hotel near Schwedenplatz and dropping our bags, we ventured out in search of the customary "vacation has officially started" libation. Now, the oft-romanticized notion of this sort of endeavor is that one shall arrive in a city, blissfully strolling the streets in a perpetual state of wonderment before eventually happening upon the perfect little cafe. You'll take a seat and peruse the menu, sipping an exquisite coffee or a skillfully paired gin & tonic just moments later. The food will be a delight to locals and savvy visitors alike, the atmosphere will be precisely what you imagined of the city, and both you and your dining companion will be in the highest of spirits, laughing jovially as you steal bites from one another's plates and ruminate on all there is to discover about your newest destination. Reality, however, is generally more along the lines of wandering aimlessly, choosing a direction based on whichever street looks nicest from where you're currently standing. Sure, you'll find cafes and bars and restaurants aplenty, but you'll be plagued with indecision. Is this place any good? Looks kind of touristy. Oh, that place looks nice. Yeah, I don't know, maybe let's see what's around the corner. Should we check TripAdvisor for something nearby? Continue ad nauseam, one or both of you inevitably growing weary and frustrated, each hoping the other will just make a satisfactory decision. By the time you've finally chosen somewhere, morale has dropped and the selected establishment now has an invisible standard of quality that it must surpass in order to restore collective disposition. So we were walking along and found ourselves on Rotenturmstraße, and in a revolutionary burst of spontaneity prompted by the alluring smell of grilled meats and a couple enjoying what appeared to be very good shawarma warps, we popped into Sababa. Let me just give an unsolicited shoutout to this place, because not only is the shawarma/kebab/döner indeed fantastic, each table is set with three sauces and those sauces really level-up the entire experience. One is a mango curry sauce, not too sweet with a hint of heat; one is a harissa sauce, nice and spicy; and the other is one that I unfortunately cannot identify with any certainty, but it's a wonderful blend of herbs, spices, and heat. Sababa was so good that we went back the next day for lunch, and gave honest thought to returning for what would have been the third time in two days for dinner. Put it on your must-eat list if you're heading to Vienna in the near future. Stomachs satiated on arrival afternoon, we returned to the streets in search of Roberto. Johan had found this bar on Google and, judging from the photos, said it looked like our kind of spot. I was initially hesitant as the full name of the place is Roberto's American Bar, and the term "American bar" brings to mind images of sports bars and chicken wings—totally fine, of course, just not what I came to Vienna for—but J told me to chill out, this was not a sports pub. Certainly, the place couldn't have been any further from such a concept. Roberto had a wonderful speakeasy vibe to it, dark and exclusive-feeling, rather grand with its enormous, pearl-studded chandelier draping above the bar like an inverted [and extremely glamorous] octopus. We were presented with a curated list of cocktails and spirits, ultimately settling on a Negroni and an Old Fashioned. Both were fantastic and made us wish we'd discovered the place about six hours later, as Roberto is really the type of bar you tend to savor most after dinner, when the evening can unfold as it may and there are no feelings of, "we should really be out exploring the city right now" as there are at, say, 4 PM or so. 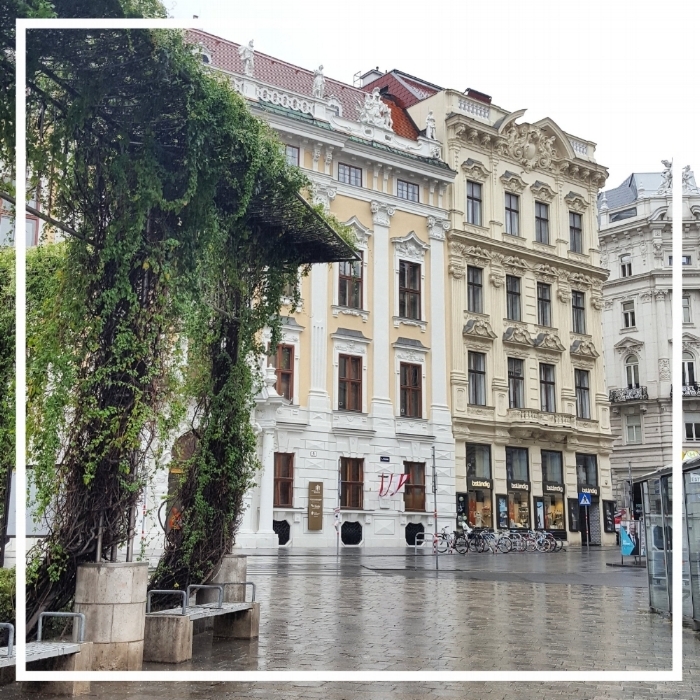 J and I wandered around for some time after our refreshments, crisscrossing the architecturally pleasing streets of Wien as we wished for the rain to go away (spoiler alert: it rained almost the entire week of our travels). Now, I've already ranted about this on Instagram, but I'll do it again here anyway. Do you see the horses in this photo? Right, they shouldn't be there. What looks like a charming little horse-and-carriage ride through a historic city is actually a dangerous and taxing affair for the live animals who must perform alongside cars, buses, trams, delivery trucks, etc. This infuriates me in every city in which it still occurs. Not only is there the obvious risk of being hit by a car, the horses are often ran ragged, over and over throughout the day as long as the tourists keep clamoring for more. Do a quick search and you'll find numerous cases of horses in various cities collapsing from exhaustion or injury, suffering from dehydration, malnutrition, overexposure...is this really worth the few minutes of being carted around in traffic so you can pretend you're time-traveling through a pre-automotive era? I can't personally speak to the care and attention the carriage horses of Vienna receive, but even if they're treated like royalty behind the scenes, the risks are still present while they're on the job. I implore you to abstain from activities like these. The only way this will eventually end is if the demand is no longer present. After more walking and a largely unmemorable dinner at a place that has probably been around too long for anyone to have the heart to suggest strategies for improvement, we called it a night and made our way back to the hotel. Vienna, much like Paris or Prague or [insert beloved European city of your choice here], is just as beautiful and alluring in the rain as it is any other time, but a steady drizzle does tend to put a damper (GET IT?! I'm hilarious) on things. The rain persisted and the clouds lingered until about 5 PM on the evening of Day Two. We'd spent the morning continuing our own little walking tour, popping into Cafe am Hof for a coffee and delicious cakes. Vienna's Kaffeekultur is no secret—cafes and coffee shops are everywhere, offering an impressive array of pastries and other temptations. We wanted to visit the famed Cafe Central (established in 1876), but apparently so did every other individual in the city as there was an absurd line of people waiting to get in each time we passed by. Even in pleasant weather I would be hard-pressed to wait in a single-file line just to walk inside a restaurant, I certainly wasn't up for doing so in the rain. Mid-afternoon, we ended up back at the hotel in hopes of waiting out the rain, and our laziness was rewarded when actual light began to creep across the sky after an hour or so of bad Austrian television. Returning to the streets, umbrellas tucked into my bag as a precaution, we resumed our walking habit until our interests were piqued by a lovely chandelier spotted in a window about a block away. Ambling over, we decided to pop in for a drink and ended up staying through dinner, partly because the menu looked good and partly because I couldn't shut up about how in love I was with the space. Once again, if you follow me on instagram you'll have seen this photo already, but hot damn was this a beautiful restaurant! It's called Le'o and you should do yourself the favor of stopping by if the opportunity arises. Not only is the space about as #aestheticgoals as you can get, they have a brilliant starter consisting of half an avocado, still in its skin and grilled just long enough to impart flavor, then topped with creamy, salty burrata. It's just as lovely as it sounds. The next day—Monday—we were off to Bratislava, but the sun finally decided to make an appearance so we spent the first half of the day hanging out in Vienna. We started with a visit to the famous Naschmarkt, which dates back to the 16th century and today consists of approximately 120 market stands, selling everything from fresh produce (just look at these peppers!) and specialty foods to various handicrafts. Somehow we made it out of Naschmarkt having purchased only a piece of baklava (me) and a beer (Johan). We explored some of the streets surrounding the market and happened upon what must be the most delightful business venture imaginable: Babette's Spices and Books for Cooks, an entire store of nothing but cookbooks (my greatest weakness), their own private label spice blends, and small counter for enjoying a coffee and cake. It wasn't actually until I was writing this post that I learned Babette's actually has two locations in Vienna, a full online shop, and even offers cooking classes, which is extremely awesome. I could have perused the shelves for hours, but we had to keep things moving as a beer tour awaited us in Bratislava that evening. "...if you're not careful, a sufficiently-distressed Käsekrainer can propel hot fat huge distances, necessitating the wearing of protective goggles and clothes normally seen in radiation labs." I was too busy stuffing my face and avoiding potential spurts of said hot fat to document our consumption, but I'm confident you'll trust my endorsement of this regional delicacy. Thoroughly fueled up, we returned to the car for the easy one-hour drive to Bratislava, Slovakia, which I'll be discussing shortly.